Paw Print Genetics - Does your Dachshund sleep too much? Maybe your Doxie has Narcolepsy. Narcolepsy is an inherited condition known to affect Dachshunds. Narcolepsy is a disorder that affects a dog’s ability to stay awake for an extended period of time. Dogs with the inherited form of narcolepsy typically show signs of the disorder between one to six months of age. Affected dogs will fall asleep faster than normal dogs and appear sleepy more frequently. Episodes of narcolepsy tend to occur with positive stimulation like play or food. The affected dog may appear to collapse to the ground with a sudden loss of muscle tone but does not typically lose awareness. Symptoms do not progress over time and do not have other associated health problems. Genetic testing of the HCRTR2 gene in Dachshunds will reliably determine whether a dog is affected with narcolepsy. Because narcolepsy is inherited in an autosomal recessive manner, the breeding of two carrier dogs has a 25% risk of producing affected pups. 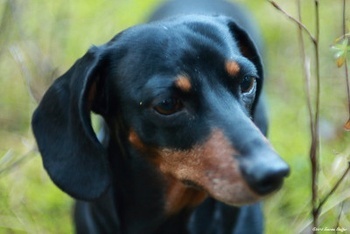 Testing is available from Paw Print Genetics™ to determine the genetic status of your Dachshund. It is recommended that carriers with this mutation are not bred to avoid affected pups.